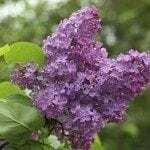 We have 4 lilac trees along our back fence. Two years ago, one of them became brittle and dead looking and produced no leaves. It is now spreading to the other three. Yesterday I was able to break it off at the ground level or simply pull it up at the ground level. What is happening?